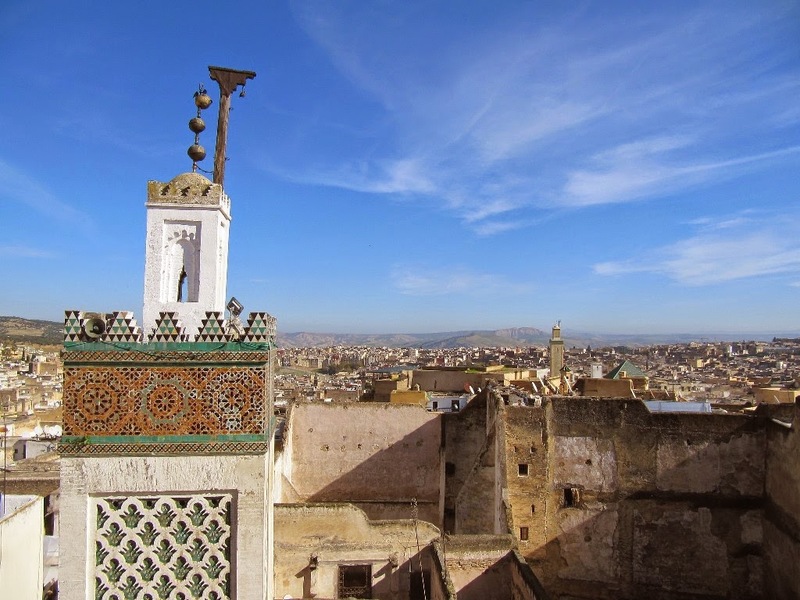 Before I went to Morocco last December I found it quite difficult to pinpoint the best place to stay in Fes. After a fair bit of research, I finally figured out that Fes el Bali is the old medina part of town and the best spot to stay. However, this is a large area! After further research, I figured out that The Blue Gate or Bab Boujloud is one of the main things to see and seemed to be the spot to be. So based on this vague information I managed to collect, I booked my accommodation a 10-15 minute walk away from Bab Boujloud. I wasn't too wrong about the location, but a few things were clarified once I got to Fes, as is always the case! So it turns out that Bab Boujloud is the main entrance to the medina. Once you go through the gate, it forks so that you can go left or right. The majority of shops and stalls are on these streets, and a few spill out into the interconnecting streets. Unless you want to see a particular attraction on one of the streets, it doesn't really matter which way you go as both have fairly similar shops. It is extremely easy to get lost in the medina's streets. All 9000 of them look similar and there are not many street signs! For the first few days, I got slightly lost trying to get to Bab Boujloud in the morning and then finding my way back to the riad again later. A 10 minute walk turned into 30 minutes very quickly! The location of the riad was fine once I got oriented and figured out where to go, but for the first few days it would have been so much easier if I had stayed really close to the Blue Gate. Why? Well one of the things about the medina is that it goes downhill from Bab Boujloud. So I found that after wandering the medina streets for a few hours, I could always find my way back to the Blue Gate if I went uphill. Easy hey? So if you are only in Fes for a few days, you will save loads of time if you are staying near Bab Boujloud and know this tip! Of course you could just do what I didn't do and buy a cheap SIM card with data and let Google Maps guide you. Then it doesn't really matter if you are staying a bit further away from the gate. Thinking about it now, I don't know why I didn't get a SIM as it would have made it so much easier. Oh well, sometimes the best way to explore is by getting lost! If you are only in Fes for a few days and don't plan on getting a SIM with data, it's best to stay as close to Bab Boujloud as possible. This means that you can see everything you need to without getting lost every day! If you are getting a SIM or have an excellent sense of direction, staying 10-15 minutes out of the busy part can be nice as you can get away from the crowds and shops at the end of the day. A final tip would be that if you are staying in a riad, make sure that they arrange for someone to either pick you up from the airport or pick you up from the nearest gate. Often the taxi drivers will only know where the gates are, not the streets because they can't drive in there. So if you can at least get someone to meet you at the gate it will mean you're not walking around dark streets late at night! I am a lover of travel, and so far I have lived in four different countries in the past five years. I have no idea which country (or continent!) I will be living in two years, and that's what I love so much about the travel bug. I hope to give it to you through my blog! Countries I've visited - 43 and counting!